The second Multiplier Event organised by Stowarzyszenie Angielski w Medycynie (English in Medical Practice Association) was held at the department of Health Sciences at Akademia Pomorska w Słupsku on the 25 th April 2017. There was a group of 44 attendees, 43 students and 1 medical English teacher from the Language Centre at Akademia Pomorska w Słupsku. The Multiplier Event was divided into two parts: the first session was dedicated to students of the 1 st , 2 nd and 3 rd year of Emergency Medicine. The second part was prepared for EMP teachers from the Language Centre at Akademia Pomorska w Słupsku and students from 2 nd year of Physiotherapy, 2 nd and 3 rd year of Public Health. The event was prepared in coordination with the Vice Head of the Department of Health Sciences, Ms. Monika Waśkow, Ph.D. and Ms. Justyns Kowalczys, the HELP coordinator within English in Medical Practice Association. At the opening part of the event Ms. Kowalczys expressed her gratitude for the meeting and gave special acknowledgements to a high number of attendees. At the same time all the participants were handed in the HELP leaflets (in English and Polish) and project business cards. It is crucial to mention that the event gained publicity a few days before it by using university’s internal networks and students’ mailing groups. The participant were already acknowledged with HELP posters at university venue. Firstly, Ms. Kowalczys described how the HELP project was born, referring to EMP teaching, internationalisation of workplace and current situation of healthcare staff in Poland. It was also crucial to mention present possibilities offered by EU funding and Erasmus+ programme. Some students were already eager to participate in the discussion about student mobility. 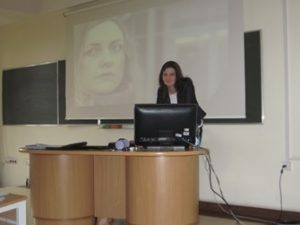 In the third place, Ms. Kowalczys concentrated on the main part of the multiplier event – presentation of the results of the finished project Output 3 – HELP Learning Material Development. The HELP platform and the HELP app were presented in details to the target audience. It was explained that HELP educational materials are divided into 14 medical modules and 6 modules on intercultural training. A lot of attention was devoted to HELP innovations, prepared especially for self-learners, like: “Tips and guidance for self-learners”, “User guide”, pronunciation exercises, recorded keywords, listening exercises with 5 speed regulations, audioscript, videos with and without subtitles, skype community, free download of all multimedia resources and a number of interactive exercises. This part deeply engaged the audience; the participants were eager to share their opinion on interculturality, the Internet used for studying foreign languages (moodle platform and apps included) and language experience from abroad. Next, Ms. Kowalczys passed on to overall presentation of educational materials available now in pdf form, on the moodle platform and as an app. One medical module (Module 3) and one intercultural module (Module 15) were shown and their main didactic aspects were discussed. A lot of attention was again paid to media applied, i.e. recordings of key words, listening exercises with velocity options, video clips and intercultural films reused from the EIW project. The audience was presented one video clip (Video Clip 1 from Module 3) and one intercultural film (“Don’t Judge a Book by its Cover” from Module 15). Subsequently the discussion was initiated. The attendees expressed their interest in the HELP project by lot of questions, mostly concerning the app for smartphones and tablets and use of project results in practice. Multimedia outputs of the project were rated very positively and participants were eager to test the new methods of learning. Finally, HELP promotional video clip was presented and all the participants were invited to HELP final dissemination conference in Olomouc, on the 15 th June 2017. Summing up, HELP didactic materials gained a lot of recognition. Students and EMP teacher valued multimedia materials for medical English training accessible easily via the Internet and the app. Importantly, participants enquired about the possibility of creating further medical modules, especially for rescue medicine and physiotherapy. In their evaluation sheets participants mentioned that they enjoyed the presentation, its clarity and positive approach to students. The HELP team was congratulated on the project’s idea as well as on hard and creative work.